Arrival at NJP Railway Station / IXB (Bagdogra Airport) and transfar to Darjeeling. After breakfast, transfer to Pelling (6000 ft /118 kms / 04 hrs). 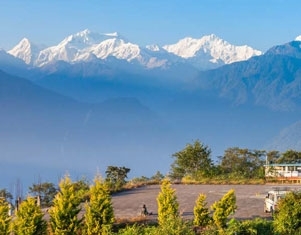 Afternoon proceed for half day local tour covering Rimbi Waterfalls, Khecheopalri Wishing Lake & Kanchenjunga Falls. Over night at Hotel. After Breakfast transfer to Gangtok (5500 ft / 132 kms / 05 hrs). Gangtok the capital of Sikkim is a beautiful and clean town. Arrives & Check in Hotel. Evening free at leisure.Over night at Hotel.